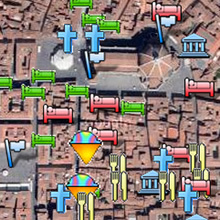 Clamber up inside Brunelleschi's famous cathedral dome for a 360º view. Indulge in a 3-hour Tuscan dinner at Il Latini. Take a daytrip to the vinyards and castles of the Chianti. So you say you want some Renaissance, eh? Well how about Michelangelo's David for starters? Then we can move on to Giotto's frescoes in Santa Croce, or maybe Brunelleschi's massive, ingenious dome over the Duomo (cathedral). And let's not forget the Uffizi Galleries, the world's mightiest congregation of Renaissance paintings, with highlights like Botticelli's Birth of Venus and Leonardo da Vinci's Annunciation. 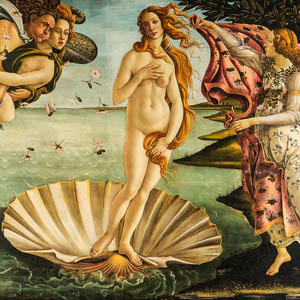 Botticelli's Birth of Venus in the Uffizi. 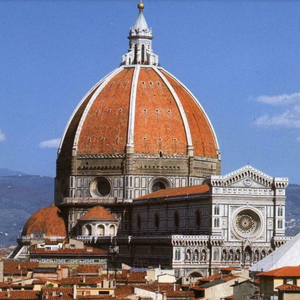 Florence was the cradle of the Renaissance. From the late 14th through late 16th centuries in Florence, an era of humanist thought, classical ideals initiated a creative boom that resounded throughout Europe, rang the death knell of the Middle Ages, and would eventually come to be called the Renaissance, a "rebirth" of culture, thought, art, and music. It helped that the 15th century saw the ascendancy of a powerful ruling family called the Medici, who—in addition to being great savvy and even better politicians—also happened to be great lovers of art and patrons of literature, philosophy, and science. Brunelleschi's dome on the Cathedral. However, Florence doesn't force you to stick to the Renaissance 24 hours a day—though it might sometimes fell that way as you make your way from one world-class art museum to the next, filling in the gaps with countless fresco-bedecked churches. Florence is still Italy, and therefore a master at living la dolce vita. When you're art-sick and museum-weary, treat yourself to a Tuscan feast with copious quantities of Chianti wine from the hills around Florence. 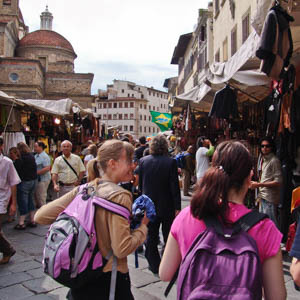 Or delve into the medieval heart of the city that gave birth to Dante and Boccaccio, two of Europe's great early poets. Spend at least two days in Florence, three if you can swing it, a lifetime if you can.